Few chairs are as versatile or as iconic as Fritz Hansen’s Ant Chair. Originally developed for a Danish company’s canteen 60 years ago, they have influenced pop culture (Remember the famous image from the Profumo affair?) and have been widely imitated (Hello, Gilbert.). Now they are raising some money for a good cause. In celebration chairs’ 60th Anniversary, Hansen has donated twenty-five chairs to Jamie Oliver’s Better Food Foundation for the BIG Chair Project. The collection of one-of-a-kind chairs have been decorated by some of designs biggest names, including Burberry, Paul Smith, Julien MacDonald and Quentin Blake, and will be auctioned off in October. Some of our favorites include the Lumberjack (which has a back pocket for your kitchen utensils), the colorful Lovely Grub by Paul Smith and the hand massage Petal Chair by Sarah Burton of Alexander McQueen. Click here to see opening prices (most are over $1000) and start your bidding! The other day I was visiting the HQ of Warby Parker, the hip online eyeglass retailer, and fell in love with this welcoming table by its entrance. It’s made up of a collection of vintage suitcases. Held together by a discreet strap, the cases vary in size and small, color-coordinated books fill in the gaps. The counter top is a simple white lacquer, and the whole thing felt surprisingly sturdy. This one was most likely custom-made for the space, but I’d bet you could craft a similar one at home. I’d fill the suitcases with some things — like all those old tax files and magazine’s I’m saving! — to help weight it down and give it some heft. A stretchy pull cord with a Carabiner hook should work keeping it in place. Here’s a similar idea that Apartment Therapy spotted at the Oakland’s Waterfont Hotel. Click here to see vintage suitcases for sale right now at eBay. Let me know if you have any bright ideas on how to tackle this project. Illustrator Kyle Hilton combined his love of pop culture with his fabulous talents to create a series of paper dolls that make me giddy! From Tarantino flicks to “Breaking Bad”, the colorful characters are rendered with their signature accessories. Leslie Knope (“Parks and Rec”) comes with a helping of waffles from JJ’s Diner, a stack of idea binders, a Sweetum’s NutriYum bar, and the Pawnee time capsule. Dowager Countess (“Downtown Abbey”) comes with an, ahem, assortment of emotions. My personal favorite is the “Arrested Development” set. 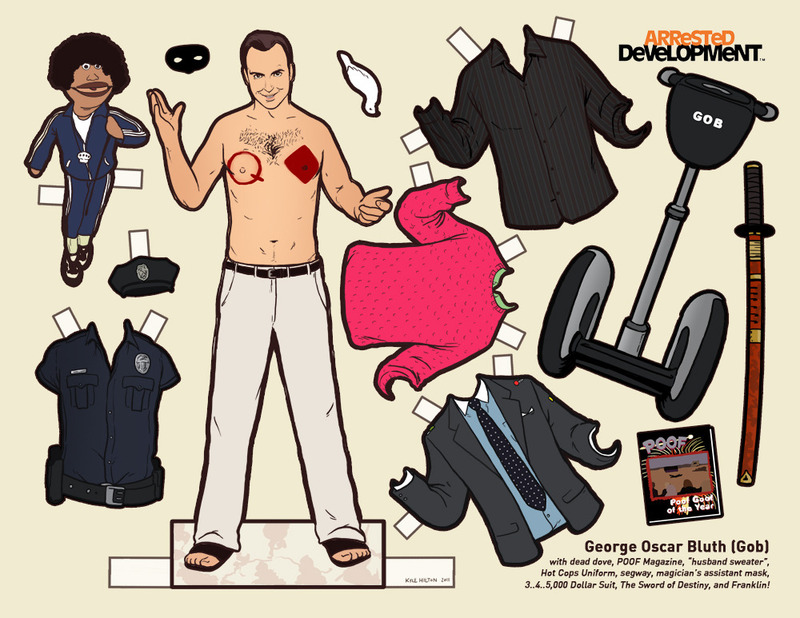 Finally, I can have my very own Gob Bluth paper doll complete with Sword of Destiny! Now if only I could have a dollhouse Magic Castle. . . .